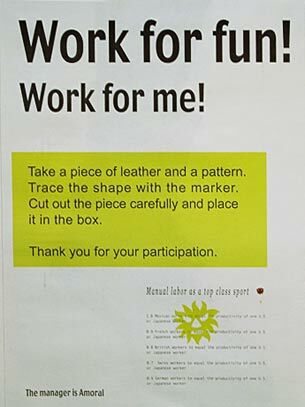 In a kind of Maquiladora (a cheap Mexican production site for the US market), visitors are invited to cut out pieces to make catchers' boots. 110 pairs of such boots, but made of ceramic, sit on a shelf. * 1970 Mexico. Lives in Mexico City and Amsterdam, The Netherlands.